Your Pug should not roam around outside unsupervised. This is probably true of any dog. A Pug does not have the greatest sense of direction and can get lost very easily. 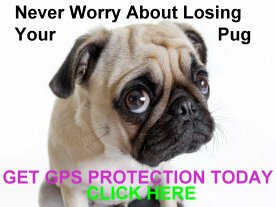 While some owners consider a GPS system for their Pug, that may not be a realistic solution for every Pug owner. A fence might make more sense. Dog fences come in all shapes and sizes and there is a lot to consider in choosing what’s best for you and your little friend. In our discussion here we will consider everything from a dog exercise pen to the traditional fence and the very popular invisible fencing that you see more and more in many places. We should stress that fencing does not take the place of supervision. This is especially true for a Pug. In case you haven’t gotten the hint by now, they like to be with their owners. If you think they’ll be happy being put outside while you’re inside you’re in for a surprise. It will take a lot of patience and whimpering from your Pug to make that happen. It’s not impossible but, given their choice, most Pugs will prefer to be with their owner. We also feel the best exercise is the traditional walk with Pug and owner out and about checking out nature together. Having said that, it also isn’t bad for your Pug to be outside enjoying the fresh air on a pleasant day. Just make sure they have plenty of water and shade on a hot day. Also make sure they are not over exposed on a cold day. Pugs are delicate creatures! Let’s take a moment to consider the various dog fences that you may want to consider. For those who do not like the look of a fence or are restricted by either building codes or funds, you may want to consider one of the many Dog Exercise Pens that are available. For many, an "invisible" fence provides the best solution for keeping their Pug contained in their yard. This can be a sizeable investment but is definitely worth considering. Invisible Dog Fences can prove to be an attractive alternative. The invisible or electronic fence has come down in price significantly and there are suppliers of top quality equipment who will ship you everything you need to do the work yourself.